Can you make this, please? I love the classic white face with black hour and minute hands, black digits or numerals, and a red second hand. I am wanting this classic face with modern complications that are in digital form NOT on a small analog dial like it seems all the faces I can find are. Can someone please make a face that's classic in front and modern in the back? If you want i will try to explain better or even draw a picture and share it with you. Thanks! Or you could try one yourself... facing is fun! So is it something like this but with modern/digital elements behind the hands? @phantasico I agree and I'm working on a drawing and will get it posted as soon as I can. Thank you for your reply. @phantasico I will try to explain the complications. 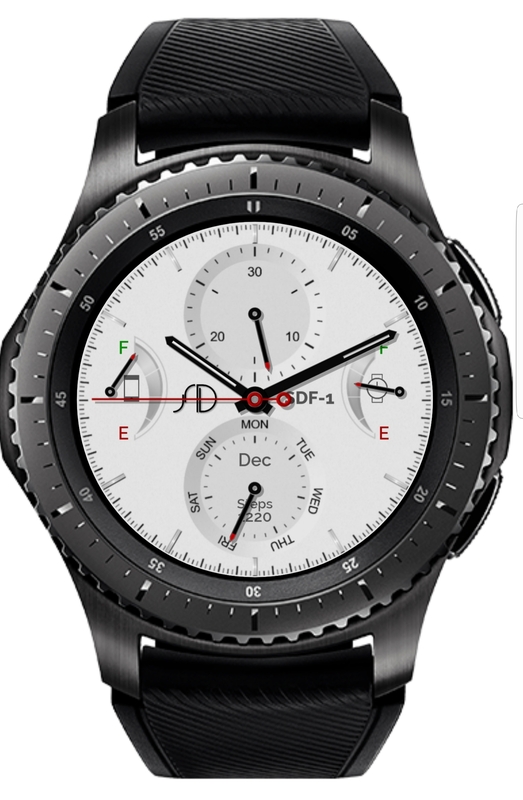 Yes, I'll gladly pay for the right watch face. I'd love to make one myself but I'm more of an ideas person and when it comes to making a face myself, I can't get what I "see" in my mind to show up on the screen. @Orion YES!!!! TOTALLY!! It's like a mullet for a watch. Analog in front with digital in back. I don't need 24 hour b/c I don't use 24 hour time. It'd be awesome if I could long-press on the digital complication and have the widget open up. I'll gladly pay for the right watch face too. Complications I'd like to see: steps, date, weather, and something else but I'm not sure which. I'd also like to have a few direct to widget launch buttons like for Samsung health, notes, a timer, phone, altimeter. Options to customize which complications and which widget launch buttons would be ideal. Options to color customize text of the complications would be nice but black on white is also great. I am building on a watch face at the moment which you may like... it‘s an analog german train station clock like and it will have the feature to open additional screens... but it will take some more time till release.